Happy New Year everyone, I hope 2017 is off to a good start! Today I'm sharing another Christmas gift that I made. This one was for my son and his fiance's home. 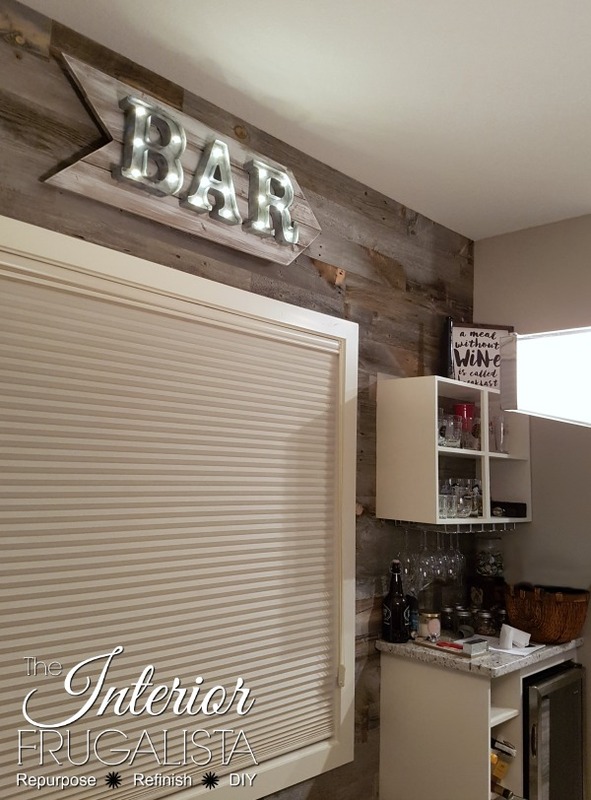 A few months ago they added a feature wall in their dining room using Stikwood Reclaimed Weathered Wood Boards. Shortly thereafter my son built a custom bar with built-in wine fridge on the wall. 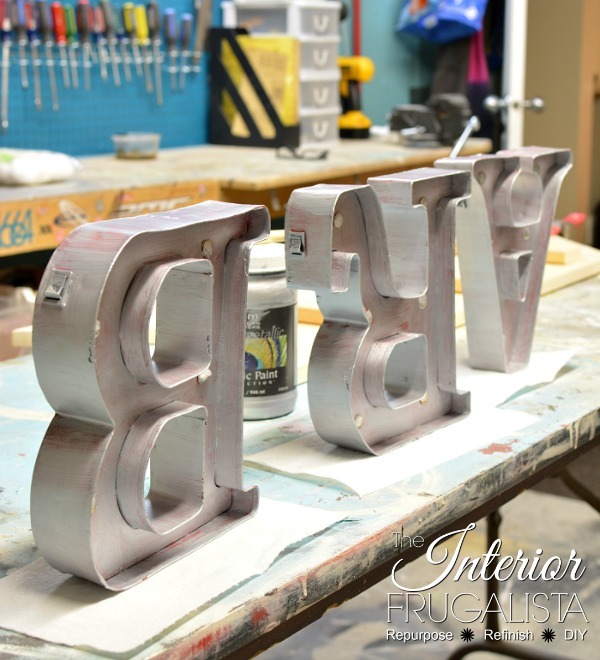 When I heard they were looking for a rustic industrial bar sign to complete the ensemble, a light bulb went off in my head. 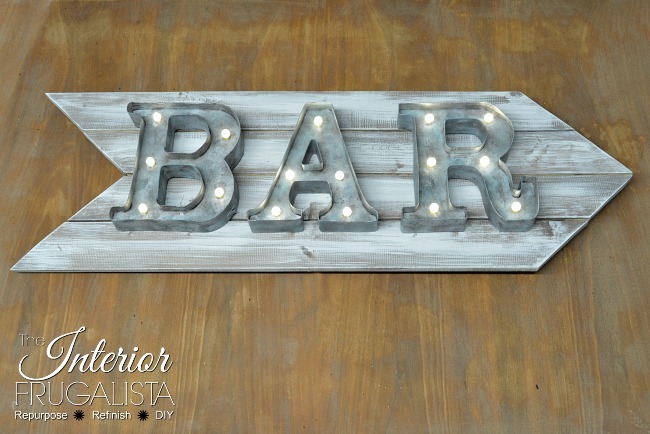 I hadn't bought their Christmas gift yet and as I've mentioned before, I love to give handmade gifts so DIYing a Rustic Marquee Bar Sign fit the bill perfectly. My son is still putting the finishing touches on the bar like building glass front doors for the top and a drawer on the base above the wine rack. I'll update this photo when he's all finished but don't you just love how the sign looks against the Stikwood wall? Here is a close-up of the sign after I finished making it and photographed on top a dining table I'm currently working on. 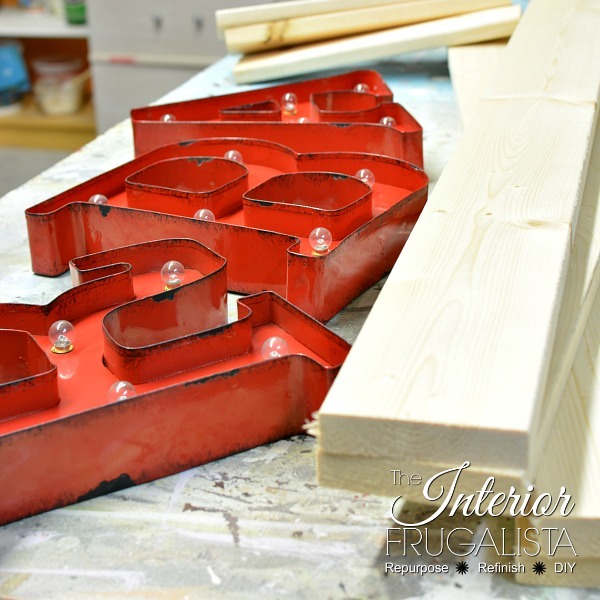 Would you believe the marquee letters used to be red? 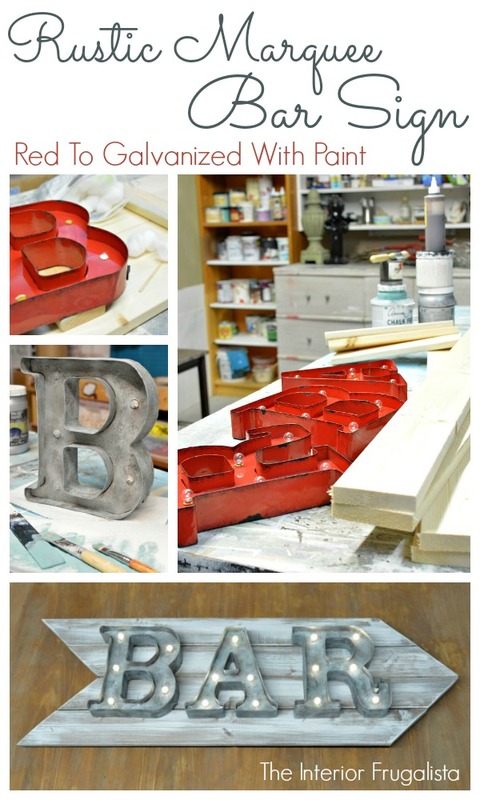 I looked all over for galvanized marquee letters but they were too large. I found these ones that were the perfect size and had a curvier style that I liked, but they were RED. 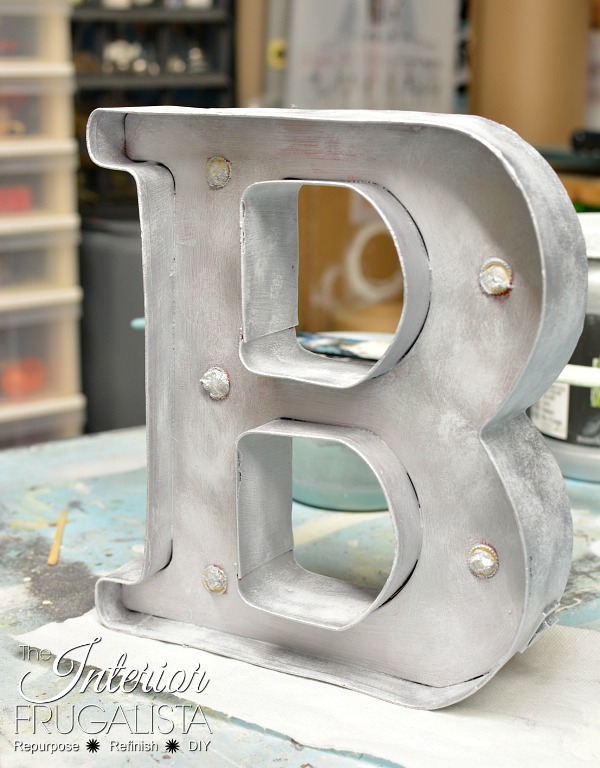 I love a challenge and so I got busy changing them to an industrial galvanized patina. I played paint brand hopscotch on this one. To make this sign, I used products from all my favorite paint brands. I split cotton balls in three, rolled them tightly and inserted into the light sockets with tweezers (make sure the batteries have been removed). 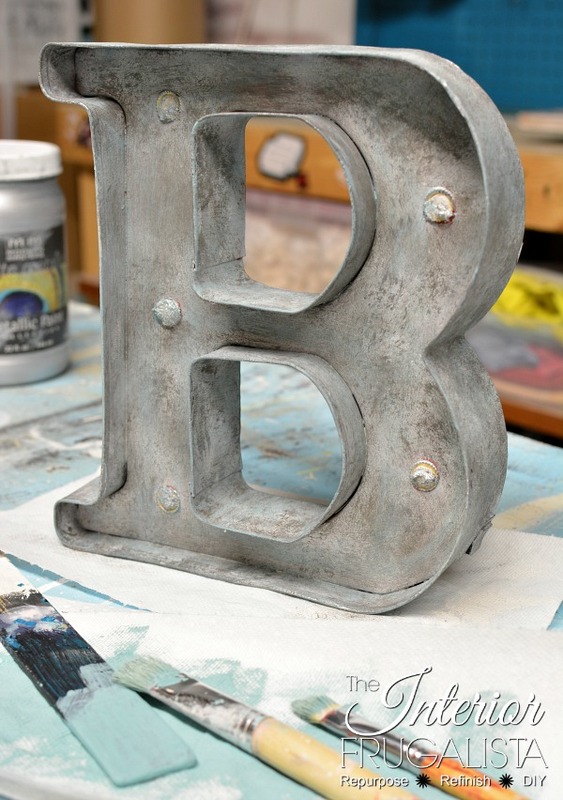 I applied the first layer of matte Silver Metallic paint with a brush. It took two coats to remove most of the original red finish. 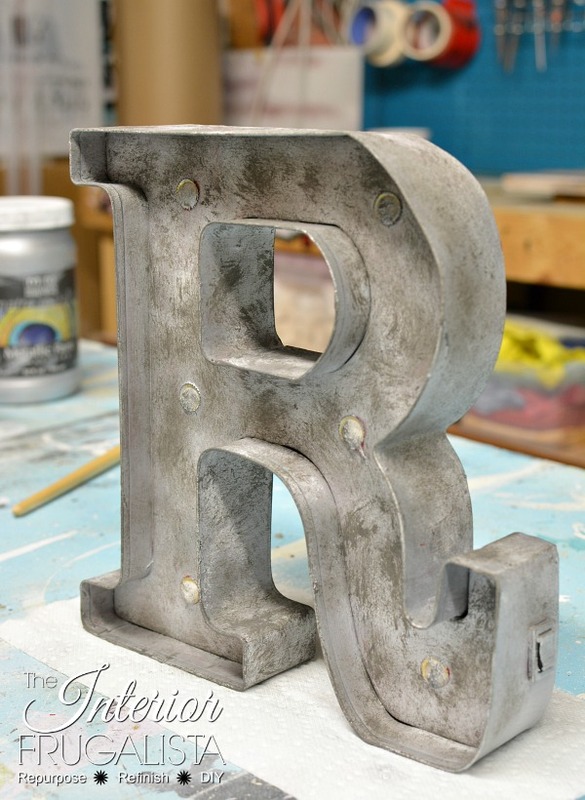 Using a small round tip stencil brush, I dabbed and rubbed random strokes of Fluff (a white with gray undertones) chalk paint. You can see in the photo above that I also carefully painted the switch on the side too. Again, using the same round tip stencil brush and dab, rub, random stroke paint technique, I applied Rocky Mountain (a charcoal) paint color. It's hard to see in the photo above but I brushed random strokes of Provence (teal color) chalk paint using small chisel paint brushes. I hit the brush along the edges of the letters as well. I added a hint of teal to match other elements in both their dining room and adjoining living room. You may remember last year the makeover I gave their MCM Tables With Faux Tin Tops. I also turned a 70's Coffee Table Into An Upholstered Bench for their entry. 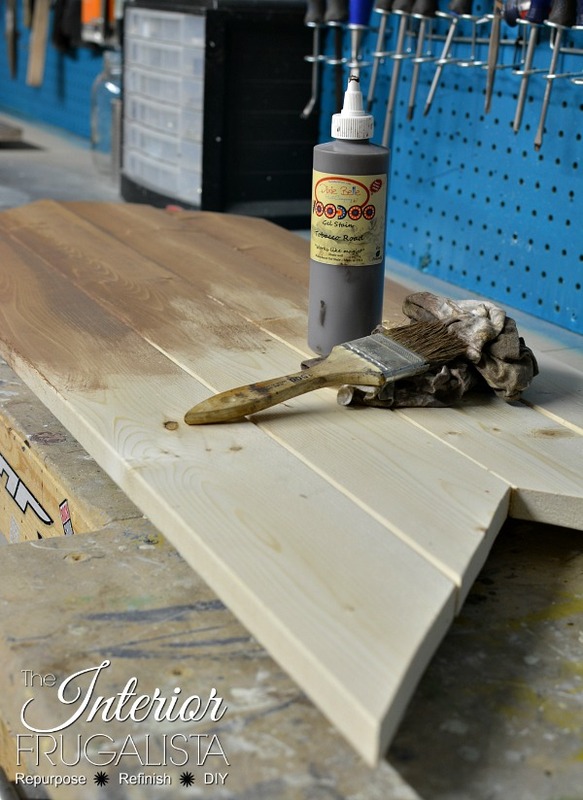 Cut four 1" x 4" pine boards 42-inches long using a miter saw. Lay them side by side and clamp in place. Cut a pine 1" x 2" board into three pieces 12-inches long (these will be the uprights). Measure 10-inches from the top of the sign and mark on each side with a pencil. 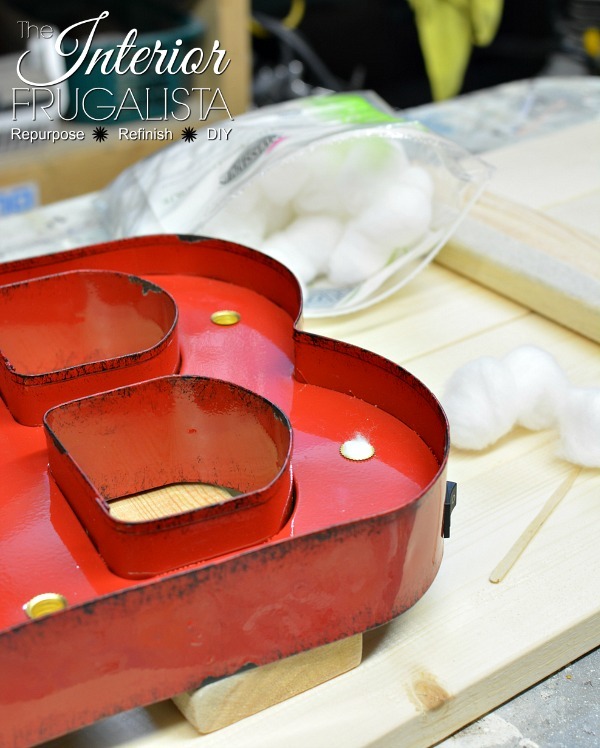 Apply construction adhesive or wood glue onto the back of one of the 12-inch boards. Lay it across at the marks you made and attach the upright using a brad nailer. Make sure to hit each board with two nails (as pictured above). Repeat these steps on the other end of the sign, also at 10-inches from the bottom. Measure the distance between the two uprights and mark the center. Attach the third upright with the brad nailer (as pictured above). Decide which side the point will face (ours faces right). Measure across the boards and mark the center. Measure 9-inches down and mark each side with a pencil. Using a straight edge, draw a line from the 9-inch mark to the center mark. Repeat on the opposite side and you have your point. Using a jigsaw, cut the point. 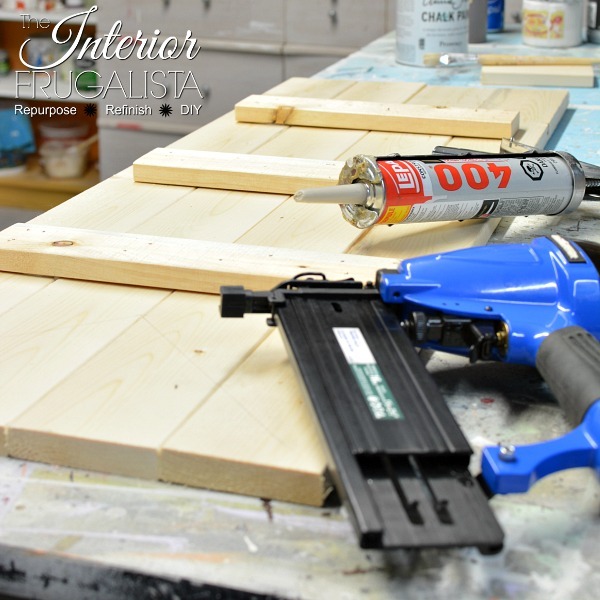 Sand the rough edges with a mouse sander. Measure 9-inches from the end of the boards and mark with a pencil. At the 9-inch marks on each side, measure across the boards and find the center. 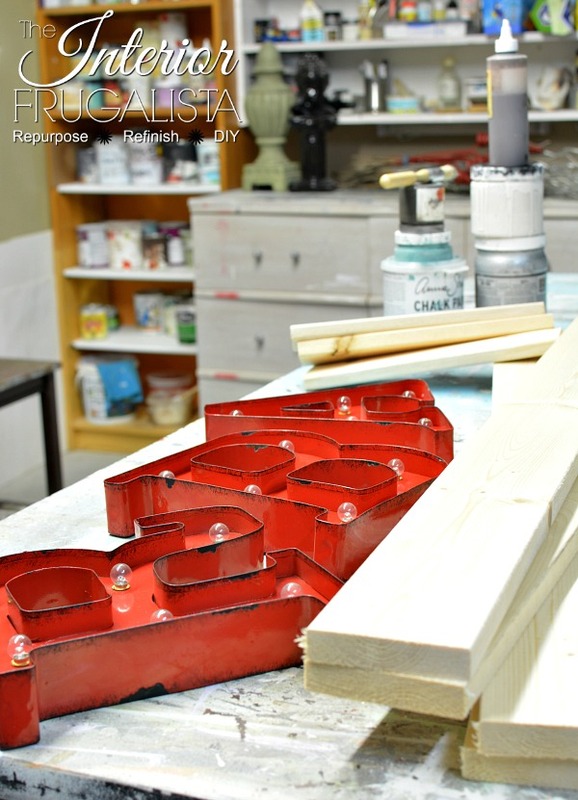 Using a straight edge, draw a line from the center mark to the end of the boards on one side. Repeat the step above on the opposite side and you have your inverted feather end. Using a jigsaw, cut the inverted point. I applied two coats of gel stain in the color Tobacco Road with an inexpensive chip brush and wiped the excess with a lint-free rag. First I dipped just the tips of my paint brush in water to dampen the bristles. 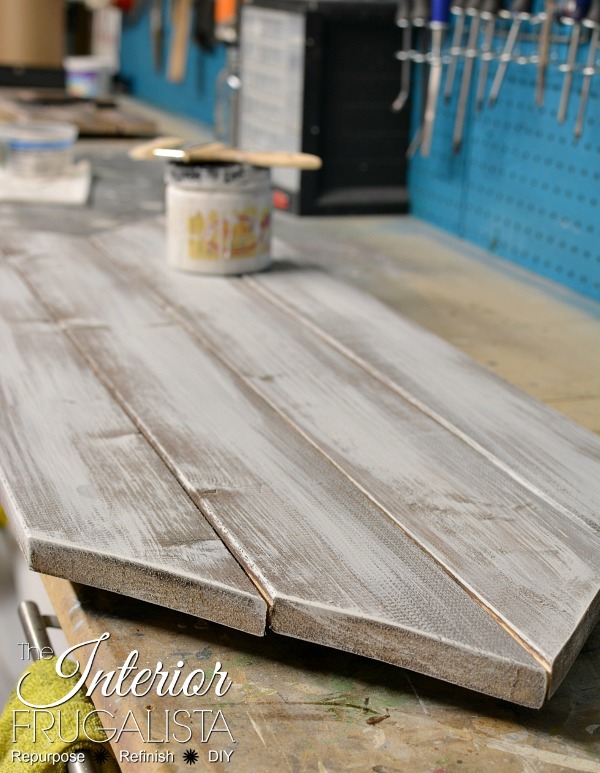 Then I dipped the tips into white chalk paint in the color Fluff and with long and random brush strokes gave the stained boards a wash of white. Mark the center of the sign both vertically and horizontally and lay the middle letter (A) on top, marking where the hanger on the back of the letter rests on the board. Screw a 1-inch wood screw into the mark and hang the letter onto the board. For the B and R marquee letters, other than measuring each letter from the top and bottom of the boards, we pretty much eyeballed the placement. The last step is adding D-Ring picture hanging hooks on each end of the top upright and you're done. 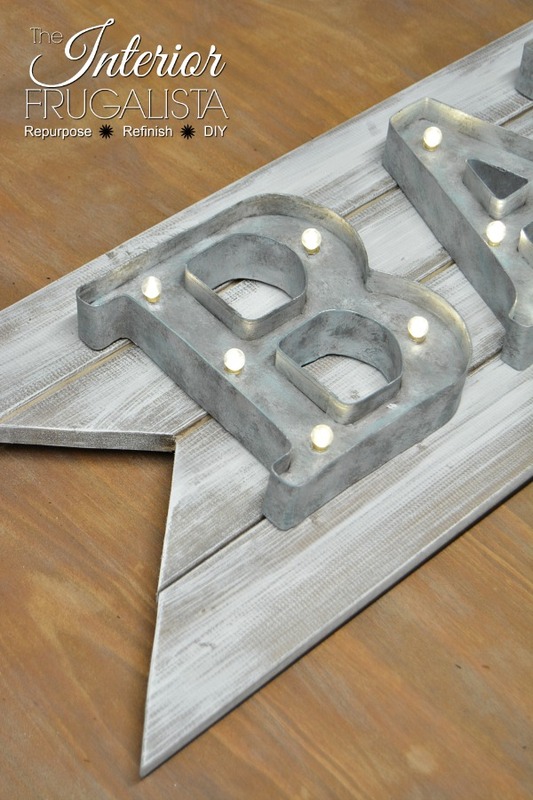 If you like my Rustic Wood Marquee Bar Sign with Faux Galvanized Letters, please share it with a friend and/or save it on Pinterest. 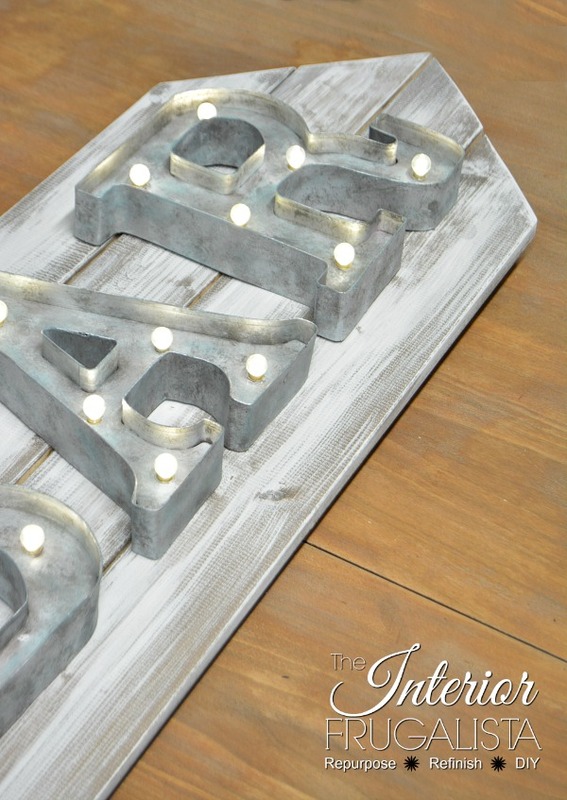 I can't wait to see this sign hanging on my son and soon to be daughter-in-law's rustic Stikwood wall.